Afe Power Mach Force XP cat-back exhaust system for the R56 Mini Cooper S 2007 and newer, R58 MINI Cooper S Coupe and R59 MINI Roadster. This is one nice quality exhaust on the market for the R56. It features dual 3.5 inch round tips and 2.5" piping to guarantee free exhaust flow through your turbo MINI. It's designed to bolt on the stock exhaust pipe behind the second cat. You will have to cut the stock exhaust to install. By keeping the second cat in place you will be 50 state legal. 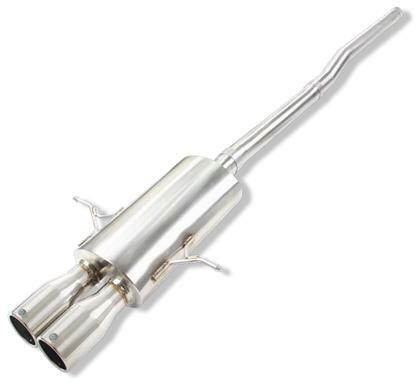 The Afe exhaust is made from 304 stainless steel and is mandrel bent with very nice tig welds.